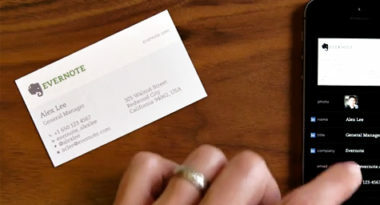 Say bye-bye to business card backlog with the new card-scanning service from Evernote and LinkedIn. The business app developer and the professional social network have partnered to make it easier for LinkedIn members to contact their business contacts by digitizing and organizing the process of business card scanning. InformationWeek.com posted details on the digital venture that will make scanning a snap and put more immediate social media connections in the cards. Evernote debuted its card-scanning service for iOS devices last year, but this new partnership will capture additional information from LinkedIn’s 300 million members. For now, the new app will only be available for iOS, but an Android version will come soon. This new app will make the business of doing business on social media more of a pleasure by easing and expediting interactions with professional contacts. The app will foster business networking, strengthen social connections, and enhance overall engagement to lead to better business. And the app will be extremely easy to use. It will automatically snap a picture of a business card and digitize the contact information. Then, Evernote will search LinkedIn for additional data on the person and create a content-rich note for the contact. Basically, the app will transform every business card into a digitally searchable contact that includes their full contact information, a photo, a link to their LinkedIn profile, and a separate section for notes. Moving forward, that business card will serve as a visual marker in Evernote when interacting with the contact. LinkedIn had previously offered members a free card-scanning service through CardMunch, which was the first card-scanning app of its kind at the time. Yet CardMunch did little more than transfer business card information into another contact in members’ phones. LinkedIn’s new partnership with Evernote will signal the end of its CardMunch service. Current CardMunch users can either transfer their scanned cards into Evernote and get two free years of service, or move their CardMunch data to a separate file that includes scanned images. LinkedIn members not using CardMunch will receive one year of free Evernote business card scanning if they connect their LinkedIn account to Evernote. If members fail to connect their account, the scanning service will require a premium Evernote account at a cost of $5 per month. Thanks to this digital partnership, this app will make it a snap to link to more information on LinkedIn contacts. See what’s working in social media networking. Contact MDG Advertising today at 561-338-7797, or visit mdgadvertising.com.